Children like to use sponges. They especially like to squeeze them. 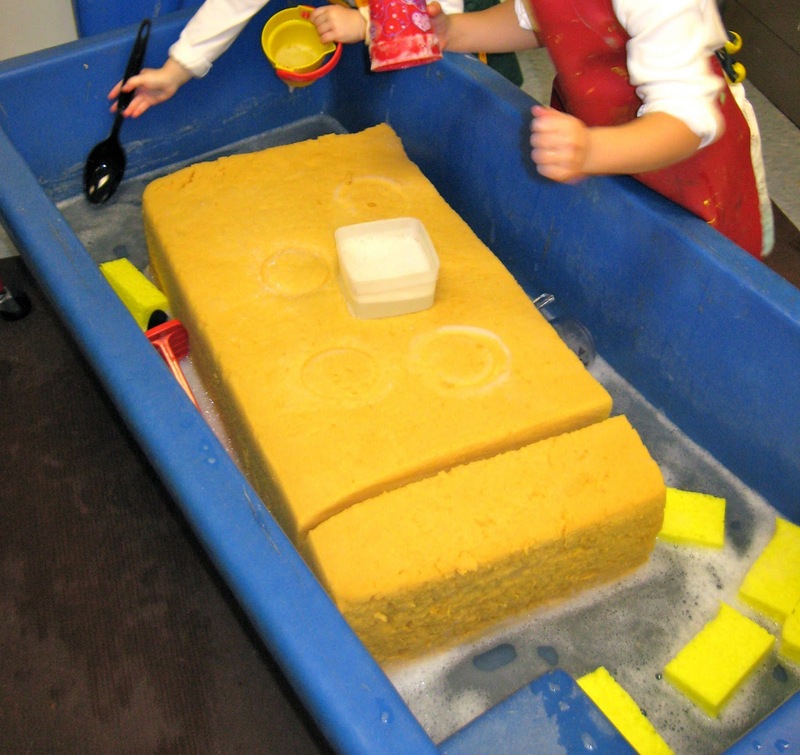 With that in mind, why not have a giant sponge in the sensory table so they can squeeze to their hearts content? Where does one find a giant sponge? The first one I used was a cushion from an old couch. I simply took off the cover and I had the giant sponge I was looking for. To make sure it was clean, I put it out on the deck at home and squirted it with dish soap. I gave my children---who were in their swimsuits---the hose to clean it anyway they saw fit. They got the cushion clean by spraying it, squeezing it, jumping on it, hugging it and other permutations thereof. In the end, they were head-to-toe in suds and the cushion wash soooooooo very clean. To set up the giant sponge, squirt some liquid dish soap on the cushion. You do not need too much. 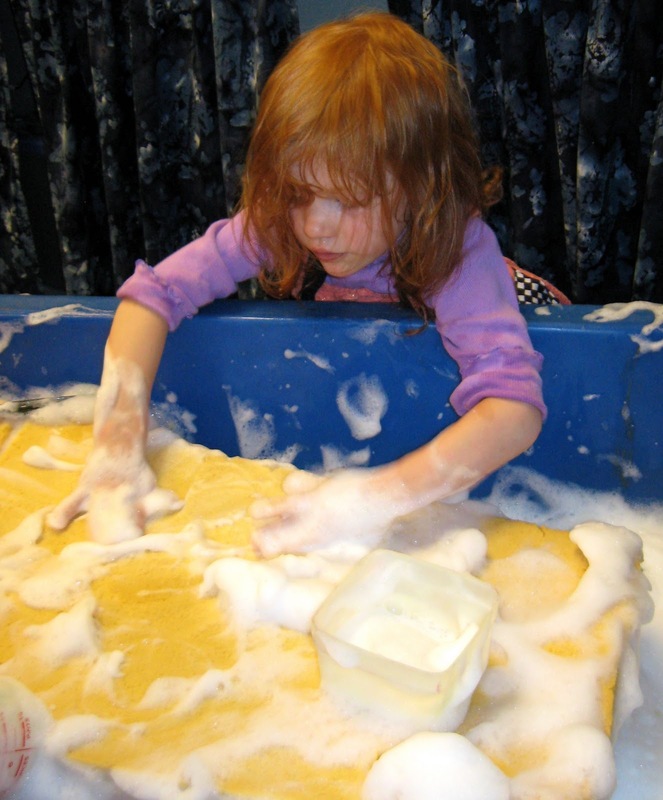 The more soap you use, the more suds and bubbles you will get. Put only a couple of inches of water in the table. If you put in more water, the cushion will float and there will be more splashing. Add smaller sponges, containers and spoons. What can you do with a giant sponge? You can squeeze it, poke it, rub it, punch it, pinch it, and push it down as hard as you can. All those actions help make suds. Of course the more you poke, squeeze and press down, the more suds you get. I guess it is time to wash the Duplo train in the pie tin. Or is it a bubble -train pie? One of the unique aspects of this apparatus is the physical characteristics of the sponge. When you push down on the sponge, you leave an impression. Here you see impressions made by different containers the children use to press into the cushion. 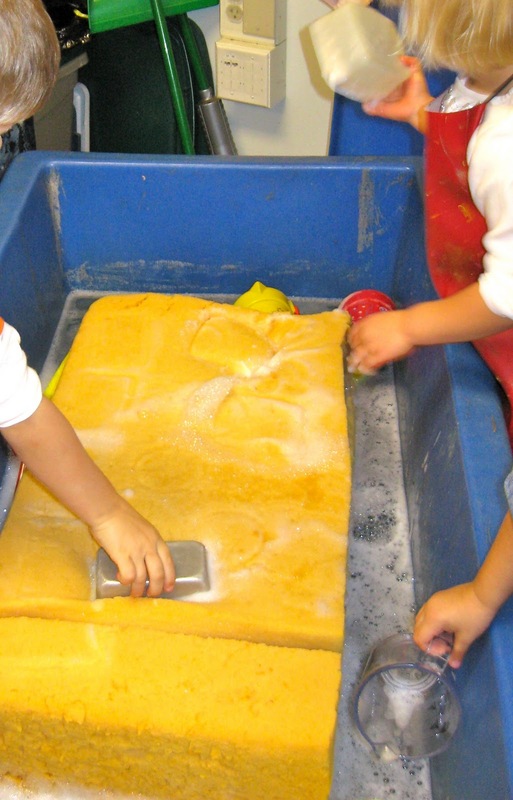 When the children press their hands down on the sponge, too, they leave a fading handprint on the sponge. And, when you pour water on top of the sponge, where does the water go? Another unique aspect of this apparatus is the physical characteristics of the suds created by the sponge. For instance, suds stick to things---like your hand. Also, suds have substance but have very little weight. You can fill a container to overflowing and it is still not much heavier than the container itself. And if you expect the suds to pour from a measuring cup the same as water, you find suds do not pour. Rather, you need a spoon to help get the suds out. 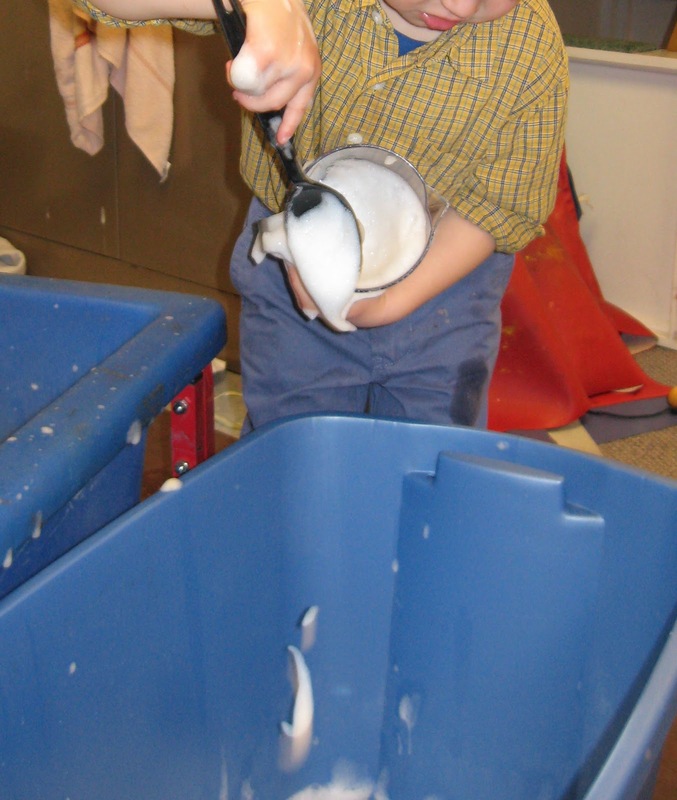 The sensory table is not simply about the senses. It is clearly a science table, too, in which the children explore, experiment and learn about physical laws governing their world. Love your Blog, Tom!!! I donr have a couck cusion- can I get a insert from the fabric store that would work just as well?? And specifics I should look for? I work at a Preschool in MInneapolis- where is your school? Thanks for the blog- My collegues were just discussing the other day the "dump and fill" behavior the kids in their 4yo class were doing with the hollow blocks and I found the blog just in time to share these ideas for the sensory table!! Heidi, I am not sure how this works since I have not been blogging very long but I will try to respond. I work for ECFE in St. Paul and have for the past 22 years. I used the couch cushion for well over 10 years. Finally, one of my colleagues could stand it no longer and and two years ago she gave me a foam mattress she was throwing out. I cut it with a long kitchen knife to fit my sensory table. The old cushion was 8 inches thick. My new foam sponge is 4 inches thick. Both have worked well. The old cushion, though, was softer and produced more suds and bubbles. After seeing the "Giant Sponge" idea, another colleague of mine went to a store that sold various sizes of raw cushion material. If they don't have it at a fabric store, they might be able to point you in the right direction.